LFB newcomer Duran Maquinaria Ensino Lugo landed 31-year old American center Britany Miller (192-87, college: Florida State, agency: ProDep Management). It is actually her comeback to Maquinaria Ensino as she has played here before. Miller played in the summer at Deportivo Quito in Ecuadorian Liga Femenina. She managed to play in three leagues in three countries last year (!!!). 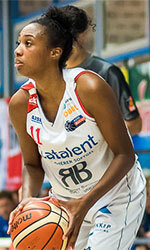 In 5 Liga Femenina games she averaged impressive 18.0ppg, 12.8rpg, 1.6apg and 1.0bpg. 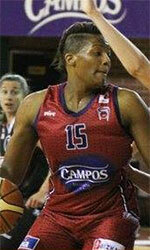 Part of last season Miller spent at Maquinaria Ensino (LF2) where in 9 games she had 10.9ppg and 6.6rpg. Miller also played for CS Municipal Satu Mare in league. In 8 games she recorded 8.5ppg, 5.9rpg and 1.0apg. In 2009 (a year after she left the college) Miller was drafted by Detroit Shock (WNBA) in second round (18th overall). The former Florida State staris in her eleventh (!!!) season in pro basketball. Among other achievements Miller won Spanish LF2 championship title in 2014. She received also Eurobasket.com All-Spanish LF2 Player of the Year award and Eurobasket.com All-Spanish LF2 Import Player of the Year award back in 2014. Miller is a very experienced player. She has quite traveled the world as her pro career brought her to seven different countries on three different continents (Europe, Latin America and of course North America). Miller has played previously professionally also in Croatia, France (Mondeville), Israel (Hapoel Zichron/Maagan Michael), Portugal (CAB Madeira), Czech Republic (KP Brno) and Spain (Mann Filter, Socinsa Bembibre and Gernika) and Ecuador (Universidad Tecnologica Equinoc. Quito).